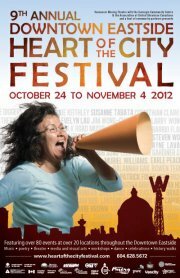 This event was on Day 7 of the 12 Days of the Heart of the City Festival. Please check the website for more events! The Festival is thrilled to partner with the DTES’s AHA Media to provide social media coverage (video/photos/blog) of the Heart of the City Festival. AHA Media gives voice to our local community and provides services for individuals and organizations to share their news and special events on a broader scale through social media. Founded in 2008 by local artists April Smith, Hendrik Beune, and Al Tkatch, AHA Media previously collaborated with Fearless City Media and has an ongoing working relationship with W2Community Media Arts and various other organizations and individuals in the DTES community. The members of AHA Media describe themselves as “definitely not mainstream media”. Based in Vancouver’s DTES, their style is described as non-invasive and unassuming. Say Hello to AHA Media as they visit the Festival events. They will be happy to chat with you. Stay connected to the festival with AHA’s links – see photos/videos of the festival events you attended; take in a festival event you missed; or follow one festival event while you are attending another! Follow AHA MEDIA on Twitter, Facebook, Youtube and Flickr!